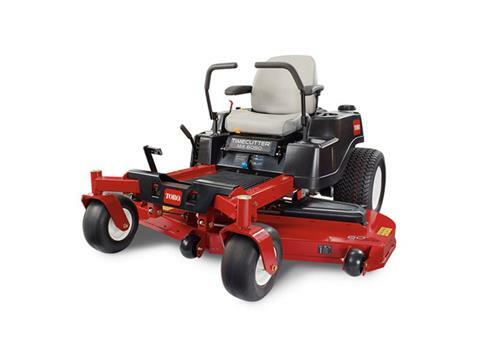 The TimeCutter MX6050 zero turn lawn mower is powered by 24.5 hp Toro® Commercial V-Twin 708 cc engine with Self-Cleaning Air Filter Housing. Featuring a 60 in. 10-ga. fabricated steel mowing deck with convenient washout port. With great features like our exclusive Smart Speed® control system you can choose from 3 speeds giving you greater control when trimming, towing attachments and mowing. 20 IN. (50.8 CM) REAR TIRES: The large, 20" (50.8 cm) diameter 4-ply rear tires deliver better traction without tearing up the turf and a smoother ride in uneven terrain. 18 IN. THICKLY PADDED PREMIUM SEAT: Premium, thickly padded 18" extra-tall seat provides ample back support for a smooth, comfortable ride.